Vanilla cookies, chocolate chip cookies, red velvet cookies, peppermint cookies… There are so many variations of cookies these days that it’s hard to pick just one cookie to choose! 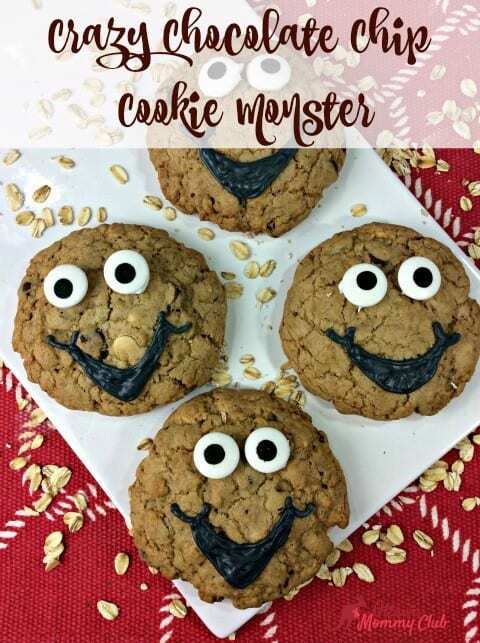 Well, why not consider making crazy chocolate chip cookie monsters instead! These are sure to please even those pesky little fingers who try to swipe cookie dough out of the bowl! Preheat oven to 350 degrees. Line large cookie sheet with parchment paper. Combine flour, baking powder, baking soda, cinnamon and salt in a bowl. Whisk ingredients together. Set aside. Using an electric mixer, beat the butter and both sugars until creamy. Slowly add one egg at a time to the butter and sugar mixture, beating after each addition. Add vanilla beating to incorporate with the butter, sugar, and egg mixture. Slowly add the flour mixture, one cup at a time, stirring to combine after each addition. Mix in the chocolate chips, stirring to add. Next, add the white chocolate chips, stir well to mix. Add in the peanut butter chips, stir well. Add both oatmeal and walnuts continue to stir to mix well. Using a ¼ cup, scoop out the cookie dough and place on the lined cookie sheet allowing space for baking between each cookie. Bake the cookies for 15 minutes or until the edges of the cookies are lightly brown. Remove from oven allowing to cool slightly before transferring the cookies to a wire rack to cool completely. Once each cookie is cool use your black decorating icing to glue on the eyes. Next, outline the mouth and fill it in with the rest of the black decorating icing. Set aside to allow the icing to dry. I hope you enjoyed the Crazy Chocolate Chip Cookie Monster recipe. If you make it, make sure to share with us on Facebook or Twitter! Also, check out all of our other Recipes. Love the faces on these cookies..lol, love the sounds of these wow they have a little bit of everything, I could go for one right now with a tall glass of milk!! Cookies themselves make me smile, smiling cookies make me laugh! These are just the cutest! My girls and I can make these fun cookies for the end-of-the-school-year party that is coming up. I love white chocolate chip cookies, nice and soft and chewy, yummy. Super cute – and sound super yummy too! Oh my goodness, you have no idea how much I love this! Thanks for sharing! I love that there are oats in the recipe… But I also love that the little ones can help decorate their cookies. These are adorable, thanks for the recipe. Would love to make these with my granddaughter next time I visit her! I love the faces on these cookies, it really makes them fun. I probably won’t decorate these, but the recipe, with lots of oats and nuts looks just great and I’ll be saving it. So cute! I am gonna try these this weekend – thank you for the recipe & Happy Holidays! These are so adorable,I just need to pick up the eyes! I made these with my grandson and he loved them ! These look delicious and the faces add a cute touch. Thank you for sharing. « Five tips for a Symptom-Free Allergy Season!